Have you got Google Earth on your computer? If so, then download the Google Earth view of Whites Tavern. Is this the wrong position for Whites Tavern? If you think so, then modify its position. Click / Tap the button above to get directions from where you are to Whites Tavern. Was our regular every Saturday afternoon when Brendan and Richard played as 121 but now they are not there we shall not be returning at all cos that band got the crowd and they pleased everyone one loss to whites tavern they are and a gain for whoever gets them !!,! Was in whites last saturday evening two lads in a band were fantastic made to believe they are there every saturday hope to return St,Patricks day wondering if the same band are on i really hope so!!!!!!!!!!!!!!!! 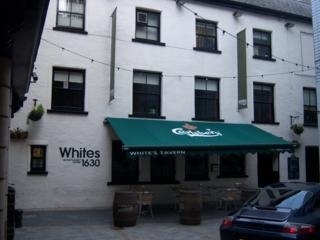 Had a weekend in belfast and had the pleasure of dining in Whites tavern very busy then a two piece band came on very talented and had a fantastic time can,t wait till i return what a day and evening we had!!!!!!!!!!!!!!! We were in this pub first week of june 2012. Great traditional pub, good staff, good beer and live music. Greetings to the old man with the 2 dogs at the corner of the bar. Look out for Jerry's, hahaha. Having previously been here for lunch we decided to go again. What a mistake! We arrived at 12.50pm and placed our food and drinks order and by 1.20pm we queried where the food was only to be told that it would be 5 minutes. By 1.35 we asked to cancel as we were going to be late for work, but were told that the food was on the way. One of the dishes consisted of cold pie swimming in a pool of gravy and the other had vegetables on it which was accidently poured onto my lap! We were told our pint and glass of cider would be removed from the bill and a discount of £1.53 given! £13.72 is quite expensive for a few chips as the rest as inedible. I would never recommend this place again! went last night great craic good traditional food none of the usual overpriced attempt at culinary cooking! staff were great yeah toilets are an issue but the friendly bouncer told us they should be re done in August had a great time with great atmosphere no thought of trouble just fun! I ordered nachos with chilli beef and a cajun chicken salad for my wife. A pint of Guinness for me, and a 1/4 bottle of red wine for my wife. What was presented as our meal bore absolutely no resemblance to the description on the menu. The cajun chicken salad had magically been transformed into an idiot's attempt at a Caesar salad. I couldn't find the chilli beef, but the Guinness wasn't bad so we decided to have another drink. The quality of the food was abominable. We tried to order a third drink, but eventually gave up waiting, and asked for the bill. The bill for this travesty was £36.40. When I questioned this, I was told that I had had three rounds of drinks, although only two had turned up at my table. Never ever again. I visited White's Tavern last night ... a great session and plenty of friendly people. Excellent staff. I'll make another visit soon to try one of their meals. Wonderful venue. Poor selection of wines, caesar salad with bacon (very strange). Nice service. Difficult to find but worth to visit, only for the ambience not for food. They made a real effort for St Patricks Day celebrations, which is a lot more than can be said for many other bars in the Cathedral area (eg J. Spewitt). They just raked in the crowds and the cash. Whites had bands, refreshments, tables and heaters outside. A great party ensued. Well done. The courtyard outside is a bonus in the summer months and takes the pressure off inside. Recommended. I went for a friends birthday. It was the worst night out I had ever had!! Downstairs was ok, but when we went upstairs there were too many people, the bar took nearly half an hour to be served at and everytime someone needed to get to the toilet they were sworn at by rude customers. And the entrance is a fire hazard with how many people are there, it was very difficult to get out for fresh air. Will definately NOT be going back!!!! visited Whites in June 2007 on a lazy afternoon. decor simplay lovelly. I will return. I've been there a few times and it has always been packed to the brim. Takes ages to get a drink and you never get anywhere to sit. But it makes up for that in just having that traditional, Irish, "everyone-havin'-great-craic" atmosphere. If you want to experience a bit of traditional Ireland, I recommend Whites. Whites Tavern is an amazing place! The staff are extremely friendly, and down to earth! It is under rated! I definitely suggest checkin it out!